A hybrid red wine grape variety was the result of a cross between Folle Blanche, a French Vinifera grape, and an unknown variety of Vitis riparia (North America). Baco noir produces a medium body, deeply tinted, acidic red wine which often has aromas of black fruit and caramel. Baco Noir has very good aging potential and can be aged for upwards of 5–8 years.The variety takes malolactic fermentation well, and makes a great Bordeaux style wine. 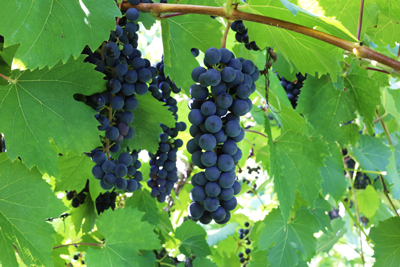 The Baco noir plants tend to be vigorous and are fairly resistant to black rot, and powdery, and downy mildews because of a fairly loose cluster.